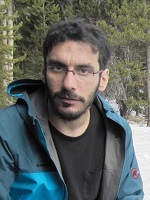 Mohammad Mahdavi received his B.Sc. and M.Sc. degrees in electrical engineering from The University of Tehran, Tehran, Iran, in 2007 and 2010 respectively. He received his Ph.D. degree in electrical engineering at The University of Texas at Dallas in May 2018. He is currently a research associate at the department of mechanical engineering at The University of Texas at Dallas. His main research interests involve design, microfabrication and characterization of MEMS devices with special emphasis on resonant piezoelectric sensors.